Dining destinations are aplenty at Mexico’s two westernmost states. Seafood and libations are top themes on Baja peninsula. BAJA CALIFORNIA — Most people who travel the world recreationally would likely tell you the one thing they look forward to in their respective travels is the local cuisine. Any venture into Mexico’s Baja California will certainly yield a fair amount of culinary options to choose from, be it street fare in San Felipe, wineries in Ensenada, bar food at the beach in Cabo San Lucas or lobster tacos in Ensenada. The close proximity of sportfishing to Ensenada, Cabo San Lucas, San Jose Del Cabo, La Paz, Loreto and San Felipe means there is no shortage of seafood at any given restaurant up and down the Baja peninsula. But you’d be mistaken if you thought seafood is all you’d find here. It isn’t hard to find Chinese, Italian, Japanese or good ol’ fashioned American food on the Malecón (or anywhere else in your chosen city). Here are a few general dining themes you can expect to find at Baja California’s boating destinations. Choices are aplenty regardless of the city you visit. A visit to Ensenada means you’ll enjoy one of two types of culinary experiences: freshly caught seafood along the city’s waterfront or a perfectly pared meal at one of Guadalupe Valley’s wineries. Shrimp or fish tacos are popular dishes to order at many of Ensenada’s restaurants. You’ll also find a selection of dishes featuring lobster, mussels or tuna. La Manzanilla and La Embotelladora are among the top recommendations for seafood dining. Those seeking the perfect place for libations should check out Hussong’s, the oldest cantina in Ensenada. The margarita was invented at Hussong’s in 1941. Shellfish and chocolate clams are the delicatessens of Cabo San Lucas, where dining with a view of the ocean is the norm. Also popular are smoked marlin, fish tacos, tamales and a dish called “comida de pobres” (or food of the poor). Comida de pobres is seafood soup made with rice and beans and served with tortillas. Cabo San Lucas does have on drinking tradition: meals are generally paired with Clamato (clams and tomato juice). Places to visit in Cabo San Lucas include Edith’s, Maria Jimenez Restaurante, El Farallon, Hacienda Cocina y Cantina. La Patrona and La Chatita. Farm-to-table and ocean-to-table are both major highlights of eats in San Jose Del Cabo. Seafood is as popular here in San Jose Del Cabo as it is anywhere else on the Baja peninsula, but this southeastern cape city is one of the few to boast farm-fresh dining. You’ll also find street tacos and everyday Mexican fare in town, as well. Check out Acre Baja, Villa Valentina, Casa Natalia, Café Des Artistes Los Cabos, Vela or Blue Fish when visiting San Jose Del Cabo. Baja California Sur’s capitol city is a place where you can find it all: five-star dining, tuna steaks, lobster tacos, Mexican-style sushi, pasta and burgers served from a grill built inside the engine block of a classic American truck. One of the best seafood restaurants in all of Baja California is Bismark and Bismark-cito (located on the Malecón). Both restaurants are known for serving fresh seafood. Bismark-cito is right on the water, so diners will have the feel of eating their dishes directly from the Sea of Cortez. The taco salsa bar here is first-rate and perfectly complements your lobster, shrimp or fish tacos. It’s quite easy to eat six to eight tacos before you realize how many you’ve eaten. A short drive or boat ride from the Malecón is Marina CostaBaja, where you will find Steinbeck’s (named after the acclaimed author of “The Grapes of Wrath” and other novels). Here you’ll find the perfect wine to pare with your steak or other high-end meal. Also be sure to check out The Three Virgins, El Toro Hueros, Mesquite Grill, Palermo’s Steakhouse, Rancho Viejo and Moe’s. The tiny beach town of Loreto has a lot to offer with such a small area. Most of the restaurants you’ll find in town are within walking distance of each other. 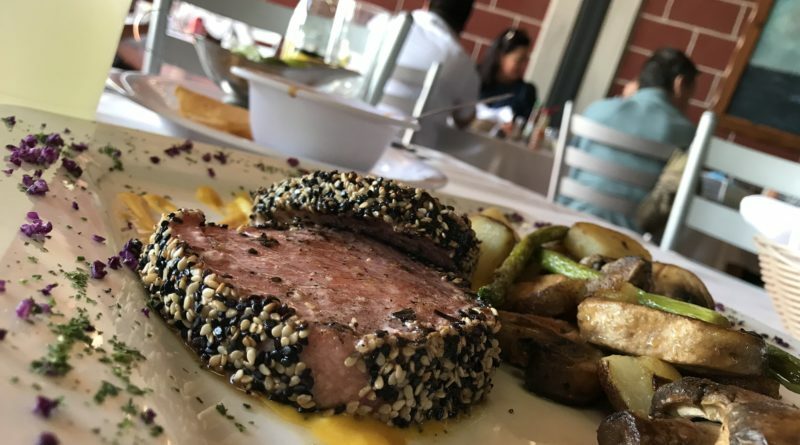 You’ll find Uruguayan food at Mezzaluna, grilled and local fare at Firehouse Grill, Japanese eats at La Terraza Sushi Bar and pizza at Pepegina’s. All of these restaurants are in the heart of Loreto and a short walk to the city’s Malecón. Resorts such as Villa del Palmar have their own choices of poolside, buffet or fine dining on-site.